Spanish Customs says its officers have seized a Venezuelan-flagged fishing boat carrying 5.5 tons of cocaine worth about $316 million. 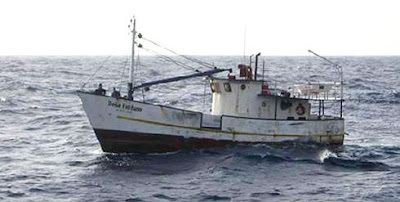 Five Venezuelan crewmembers are under arrest.The agency says the 52-foot boat Dona Fortuna had been under aerial observation for three days and was seized as it approached the southwestern Canary Islands.Officers boarded the vessel early Thursday when it was 900 miles, northwest of Las Palmas.A Customs statement says officers also intercepted a high-speed boat loaded with gasoline that was preparing to depart from the northeastern port of Noya. It says the agency suspected it was about to rendezvous with the Dona Fortuna.